To a point guard, the Western Conference has to feel like a field littered with land mines. At the end of that field, is a championship trophy. But, at every step, you are bound to encounter a detonation. All the land mines come in different sizes with different modes of exploding. And if it wasn’t bad enough, the Dallas Mavericks, who had some of the dullest land mines on the field, went and added another shiny land mine to the field. If this was David Stern’s vision of a handcheck-less NBA, well then, mission accomplished. This is the first of four meetings between these two teams. The Mavericks won the season series last year 2-1. The first two games weren’t very close, but the third was an overtime game that Dallas eventually won. Because of locale, these games carry a little more meaning than most NBA games around here. It’s almost like the Red River Rivalry of basketball. 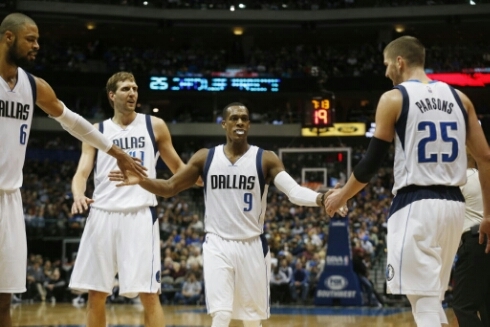 The Dallas Mavericks currently have a 21-10 record, good for 5th in the Western Conference. They sport the best scoring offense in the league at 109.4 points per game and the 2nd best offense in terms of offensive rating. Their current starting line-up is considered to be one of the best, if not the best, in the NBA. The defense, though, is in the bottom third of the league in terms of defensive rating and points allowed. They score a lot, but they also allowed a lot. Leading the Dallas attack is the newly acquired Rajon Rondo. After showing that he had recovered sufficiently enough from an ACL tear from two seasons ago and a hand injury at the beginning of this season, the Mavericks made the move to obtain Rondo from the Celtics. In his first 4 games with Dallas, Rondo is averaging 13.3 points, 6.3 rebounds, 8.8 assists, and 1.8 steals, whiling helping the Mavericks to a 2-2 record in that span. At the other guard, Monta Ellis’ production has seemed to wane since the arrival of Ronda. Ellis was used to being a high-usage guard that could work with the ball in his hands. Now, he’s truly an off-guard playing off the ball. It’ll be interesting to see how that dynamics works itself out. At the forward spot, Chandler Parsons is giving the Mavericks basically the same thing he gave the Houston Rockets in his first 3 seasons there: good perimeter shooting and the ability to drive when covered closely on the perimeter. At the other forward spot, Dirk Nowitzki is a lot like another ageless power forward, Tim Duncan. You think they are going to eventually slow down, but they continue performing at the same level they have for the past 5 seasons, except more efficiently. In the middle, Tyson Chandler provides shot blocking and a great target for the pick and roll. While the Rondo trade may have strengthened the starting unit, it also weakened the bench. Gone are Brandan Wright, Jameer Nelson, and Jae Crowder. The bench now consists mainly of veterans near the end of their careers: Charlie Villanueva, Devin Harris, and Richard Jefferson. 1. Perimeter Defense – The dribble drive ability of Rondo and Ellis will open up opportunities for Chandler off of pick and rolls and for the bevy of shooters on the perimeter. It will be extremely important for Westbrook, Roberson, and Reggie Jackson to stay in front of their man and prevent any penetration. 2. Transition Opportunities – With the long ball comes long rebounds and transition opportunities. Dallas isn’t necessarily a quick team with stellar athletes, so this may be a phase of the game where the Thunder can take advantage. 3. 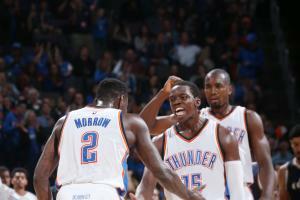 Bench – The Thunder bench has taken a bit of a hit lately due to its inconsistent play. 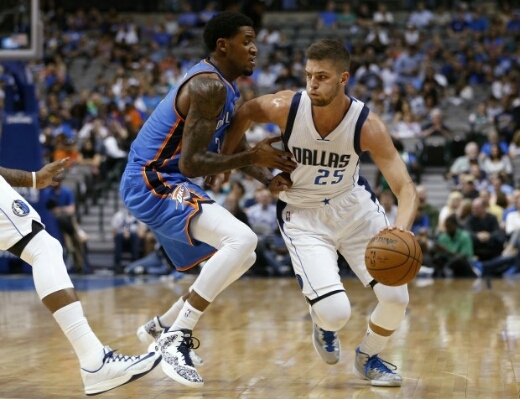 With Dallas’ weakened bench, look for the Thunder reserves to assert themselves early in this game.